For a long time I had a mental block about artichokes thinking they were too fiddly to prepare any other way other than boiling whole and serving with vinaigrette. I’m over that now. They’re no different than preparing any other vegetable and the end results are delicious. 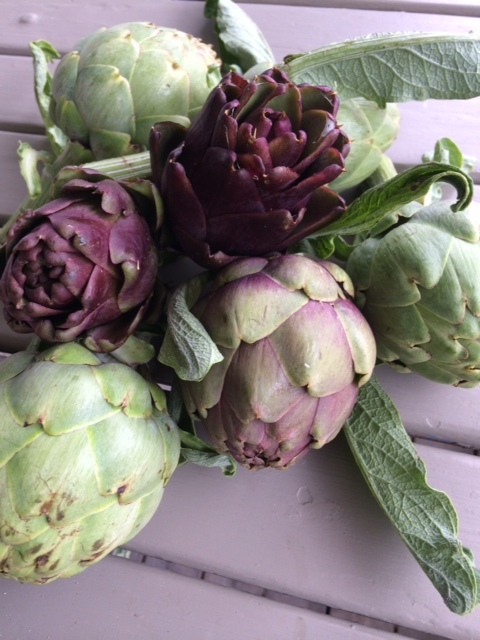 Artichokes are readily available from stallholders Jason, Terry Lister and Fresh Gardens but unfortunately the season is quite short. This recipe is great as an entrée, light lunch with a green salad or with fish or chicken as part of a main course. Prepare the artichokes one at a time. Firstly half fill a large bowl with cold water and juice of two lemons. Cut all but about 2-3 cms from the stalk end of the artichoke. Pull off at least 2-3 layers of the tough looking outer leaves. Next cut off the top half of the remaining leaves and cut the artichoke in half lengthwise. Dip both halves in the acidulated water. Using a sharp knife cut out the hairy choke and pull out the leaves in the very middle. Put the half back into the water immediately (cut edges of artichokes brown very quickly when exposed to air). Do the same with all the artichokes. If you’re using large artichokes cut them into quarters. Leave the artichokes to soak while you start the next stage. Heat some olive oil in a frying pan. Add the onion and turn the heat to low, soften the onion a little then add the bacon and, after a minute or two, the garlic. Cook gently for about 5 minutes. Turn the heat up to medium. Dry the artichoke halves. Place them flat side down in the pan adding a little more oil if necessary. Add the thyme and chopped basil. Brown the artichoke pieces and then add the wine. Let it bubble until nearly all the liquid has gone. Add about 150ml of the stock. Cover the pan and cook on low for about 10 minutes. If it gets too dry add more stock. Add the tomatoes, cover and cook for another few minutes. If the tomatoes aren’t very sweet add a little sugar. Season. Remove the cover and simmer to reduce any excess liquid. Near the end add a good splash of olive oil. Serve warm or at room temperature sprinkled with chopped basil.